Tanzart Hannover welcomes you to celebrate the 12th Rainbow-Trophy in the wonderful premises of the Tanzhaus Bothe in Hanover on 24 November 2018. Many of you already had the pleasure to enjoy the wonderful atmosphere and exciting competitions of the Rainbow Trophies of the past years. 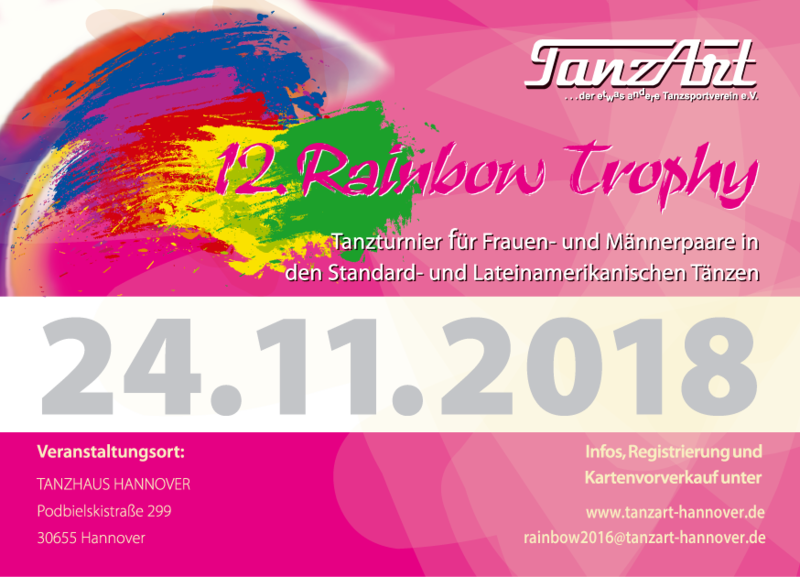 … this year we invite you to join the 12th Rainbow-Trophy at the Tanzhaus Bothe (Podbielskistr. 299 B, 30655 Hannover) which provides best conditions for both dancers and the audience! The couples who do not qualify for the finals (evening event) can get the tickets for the ball at a preferential price of 7,50 EUR per ticket. We would be very happy to welcome you as our guests at the ball and we would appreciate if you support the couples in the finals – even though you might not have qualified for the finals.